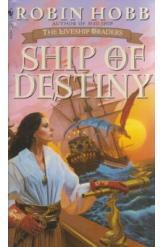 Ship of Destiny by Robin Hobb, Sci Fi. While the maligned Ronica Vestrit struggles to unite Bingtown against the Chalcedean threat, Althea Vestrit continues her quest to recover the liveship Vivacia. When she discovers the true nature of the liveships, all are threatened. Book three of the "Liveship Traders" trilogy. Book is in good condition, all pages intact.